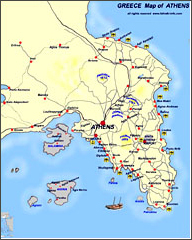 - Athens, Hydra, Aegina, Poros, Corinth, Epidaurus, Nauplion, Mycenae, Olympia, Delphi & Kalambaka/Meteora. In the morning we visit the site and the Museum. We continue through Amphissa, Lamia and Trikala to Kalambaka for dinner and overnight.